Curious about how the Tesla Model 3 performs in everyday driving? Read on! Categories: EV Charging Stations | Permalink. Categories: #CityofAtlanta, #ElectricVehicles, #EVSalesData, #Homecharging, #NissanLEAF, #Plug-In Hybrid, EV Charging Stations | Tags: #BOLT, #ChargingStations, #Chevrolet, #Driving, #electricity, #ElectricVehicles, #EVCharging, #EVsales, #Model 3, LEAF, Model S, Tesla, VOLT | Permalink. Georgia has the highest EV user fee in the U.S. – let’s fix that! In 2015, Georgia passed a new user fee on electric vehicles (EVs). This $200 fee (increasing annually) makes EVs the highest taxed vehicles on the road in Georgia. It is negatively impacting adoption and reducing the ability of more Georgians to adopt this new, cleaner technology. Georgia lawmakers have the opportunity, right now, to help reduce that fee. HB 317 was introduced that will reduce the fee from $200 to $100. While this fee is still higher than many of the other states that impose such a fee, it will reduce the burden to current and future EV owners. Help us keep the pressure on! Please contact your Representative and the Transportation Committee Chairman (instructions below) TODAY! Time is critical! Personal emails are more effective than automated emails, so please copy, paste and send from your personal email address. Add your personal story to the sample text provided below. Copy and paste the sample text; customize it, especially if you drive an EV! I am writing to urge you to support HB 317 that would lower the punitive electric vehicle user fee. I drive a (INSERT YOUR EV HERE). I am paying more in road use fees than a pickup truck or an SUV. I agree that a road use fee is fair for an electric vehicle, but the current fee is unfair and punitive. I currently pay tax on the electricity I use to power my EV, but I am now also paying the $204.20 user (registration) fee plus an additional fee for the Alternative Fuel tag ($35). EVs are now the highest taxed vehicles on the road in Georgia. It is negatively impacting retention and adoption of electric vehicles and reducing the ability of more Georgians to adopt this new, cleaner technology. Alternative fuel vehicles are good for the Georgia economy as they are using power generated in Georgia and the dollars stay in Georgia. Please reduce the user fee and support bill HB 317. Categories: #ElectricVehicles, #EVRegistrationFee, #GeorgiaStateLegislature, EV Charging Stations, EV Charging Stations, EV Tax Incentives | Tags: #ElectricVehicles, #Georgia State House, #Registration, #RepKevinTanner, Taxes | Permalink. Reprinted here is the entire story written by AJC staff writer Chris Joyner published on line on January 13th and in newsprint on January 16, 2017. Copyrighted material – Atlanta Journal Constitution. Here’s a fact maybe not generally appreciated by commuters gazing at Atlanta’s smudgy, smoggy skyline: Georgia has the second most electric vehicles in the nation. Here’s another fact: Not for long. Georgia has about 25,000 electric cars on the road, mostly in metro Atlanta and largely funded by what was one of the most generous state tax incentives in the nation — a $5,000 state income tax credit. But state lawmakers, many of them conservatives who are predisposed against consumer tax credits anyway, canceled the credit in 2015 and installed a $200 registration fee instead. That whipsaw effect pushed new electric vehicle purchases off a cliff. In July 2015, the state registered 1,426 electric vehicles purchased as the tax credit expired. The next month, just 242 were registered — that’s an 83 percent drop and sales have not rebounded. The impact also can be seen in the decline of specialty license plate sales for alternative fuel vehicles, which are tied to the registration fee. Every all-electric vehicle — as well as some other alternative fuel vehicles — is subject to a $200 fee. Owner of such cars can opt to get the specialty license plate in return, giving them access to Atlanta’s HOV lanes. However, since the change in state policy, monthly license plate sales are down nearly 60 percent. For champions of the clean-fuel cars, the statistics are sobering. Backers of alternative fuel vehicles like Cohen have complained that lawmakers turned one of the friendliest states to the electric car into one of the least hospitable. No one disagrees with that, but it made some conservative lawmakers uncomfortable. Sen. Butch Miller, R-Gainesville, served on a special joint study committee created last year to look into alternative fuel vehicles and said the dramatic decline shows the tax credit only propped up an industry that didn’t have wide consumer support. Attempts last year to reinstate a version of the tax credit failed, and the joint study committee met three times last year and issued no recommendations. And Miller made it clear the committee was taking a wait-and-see approach to any new measures. Advocates hoping the state would consider new incentives got little encouragement from the study committee. Francis testified at the final meeting of the study committee that the elimination of the tax credit was costing both consumers and the state money as drivers spent more on gasoline and most of those dollars left the state. Francis said it was pretty clear the committee wasn’t interested in revisiting the tax credit and instead focused on what the state could do to support business uses for alternative fuels while supporting refueling and recharging infrastructure. There are no disinterested parties here. Miller, for example, is a car dealer and not for Tesla. Cohen is North American sales manager for General Electric’s vehicle charging stations. Car companies like Chevrolet and Nissan, which produce the most popular all-electric cars, are weighing in as well. Sales of specialty license plates for alternative fuel vehicles plunged when the General Assembly removed a $5,000 tax credit for electric cars in 2015, as figures from the Georgia Department of Revenue show. But there are legitimate policy questions too. Should the state put a thumb on the scale to entice consumers to buy one type of car over another? Are consumer tax credits bad policy generally? Doesn’t the state have an obligation to address air quality and climate change by encouraging clean energy? Francis, Cohen and others who want more state support for electric vehicles are retooling and focusing heavily on the annual registration fee. The fee, which this year will be slightly above $200, is meant to offset the gas tax which electric vehicle owners obviously do not pay but go to fund repairs on the roads everybody uses. However, the indexed fee, which this year will be slightly above $200, is the highest in the nation and there appears to be some support for lowering it. “I think that’s a realistic priority,” Cohen said. Cohen is bullish on electric cars (he owns three) and believes that sales will slowly rebound on their own, particularly if the lawmakers reduce the penalty to something less punitive. Francis said there may be a way to return a portion of the tax credit’s incentive by giving buyers a break on sales tax at the point of purchase. “A lot of states are doing sales tax exemptions rather than credits,” he said. Whatever the outcome, unless policy changes soon, Georgia’s unlikely position as No. 2 on the electric car rankings (way, way, way behind No. 1 California) likely is doomed. As AJC Watchdog, I’ll be writing about public officials, good governance and the way your tax dollars are spent. Help me out. What needs exposing in your community? Contact me at cjoyner@ajc.com. Categories: #ElectricVehicles, #EVSalesData, #GeorgiaStateLegislature, #TaxCredit, #TaxIncentives, EV Charging Stations | Tags: #AlternativeFuel, #Clean, #GeneralElectric, #GeorgiaGeneralAssembly, #GeorgiaPublicServiceCommission, #taxcredit, CleanCitiesGeorgia, Tesla | Permalink. EV Charging Comes to Atlanta Airport! EV Charging Comes to Atlanta Airport and in a BIG way! What started out as a conversation between Georgia Public Service Comissioner Timothy G. Echols, City of Atlanta Mayor Kasim Reed and his Director of Sustainability Stephanie Stuckey Benfield (recently promoted to Chief Resiliency Officer) has advanced to the first phase of three phases of electric vehicle charging stations at Atlanta’s Hartsfield Jackson International Airport. The first 102 charging ports were officially unveiled on Thursday January 12, 2017. And that was very welcome news to metro Atlanta EV drivers. How did this finally happen? Read on about the individuals who led the charge to make electric vehicle charging at Hartsfield-Jackson International Airport happen. Don Francis, Executive Director Clean Cities Georgia. Don has been championing charging at the Atlanta airport for at least five years and has been actively part of the planning process that has brought the first phase of chargers. Don’s widespread network of government, industry and think tank partners along with his deep knowledge of EVs and EV charging drives his quest to ensure that the state of Georgia continues to support the growth of electric vehicles and reduces our dependence on foreign oil. Don has overseen charging station infrastructure in Georgia for over 20 years, going back to the GM EV1 project. Tim Echols, Commissioner, Georgia Public Service Commmission. Tim has been the most vocal publicly elected official supporting electric vehicles and charging stations for years. Tim took a position during the 2015 Georgia General Assembly to retain a modified ZEV/LEV vehicle tax credit to continue to support clean energy and to improve Georgia’s air quality. Guest Post by Tim Echols, Commissioner, Georgia Public Service Commission: Why Retain the ZEV/LEV Income Tax Credit In Georgia?As a tireless champion, Tim does not give up easily. It was Tim’s conversation with Mayor Reed and Ms.Benfield that sparked the commitment on the part of Mayor Reed to aggressively ‘close the EV charging gap’ at Hartsfield Jackson International Airport. Tim builds bridges ‘across the aisle’ as demonstated by his re-election to the Georgia Public Service Commission this past November, garnering the largest number of votes of any elected official in the history of the State of Georgia. Stephanie Stuckey Benfield joined the Mayor’s Office as Director of Sustainability in mid-2015 and immediately began to make her mark on alternative fuel vehicles. The City’s fleet began to transition from ‘gas guzzlers’ to fuel efficent vehicles with charging infrastructure to support the city’s EVs. Stephanie, who is known to ride one of the city’s bicycle’s to meetings downtown, together with Don Francis and Tim Echols, saw the huge need for electric vehicle charging at the airport and in partnering with the Airport Sustainability team, initiated the dialogue with Mayor Reed suggesting that maybe 50 stations were needed. His Honor quickly increased that number 6-fold. Stephanie is truly walking the talk and recently purchased a pre-owned 2014 Tesla Model S 60 following a test drive of a new Tesla at the City of Atlanta’s first Electric Vehicle Ride & Drive event. True to her values, Stephanie purchased a ‘recycled’ electric vehicle! Paul Bowers, Chairman, President and Chief Executive Officer Georgia Power, A Southern Company. It takes amazing commitment on the part of a public utility to get behind an initiative with candidly, a negligable ROI. With just over 25,000 EV’s, it would have been very easy for Paul Bowers to politely decline support for the EV Community Charging program, which is in the process of rolling out up to 61 recharging islands with both DCFC and Level 2 stations throughout the State of Georgia. Instead under Mr. Bowers leadership, Georgia Power has embraced and significantly advanced the ability to own an electric vehicle in Georgia as the result of the series of committments that he and his organization have made, including supporting the multi-year charging stations project at Atlanta Airport. When asked about the timing for electric vehicle charging at the airport, Mr. Council’s predecessor said 2-3 years aligned with the new parking decks.When Mayor Reed gave the word just several months ago (summer 2016), Mr. Council got to work and found a way, partnering with Polly Sattler, Senior Sustainability Planner, to make electric vehicle charging happen throughout the airport in January 2017! Thank you Mayor Reed for lighting the fire and thank you Mr. Council for carrying the torch! The January 12, 2017 media event was held in the International Terminal Short Term parking deck where 75 people gathered for the announcement, several of whom were delighted to plug and and charge up during the event many had been waiting for a very long time! Categories: #CityofAtlanta, #CleanCitiesGeorgia, #ElectricVehicleChargingStations, #ElectricVehicles, #GeorgiaPower, EV Charging Stations | Tags: #Airport, #Atlanta, #ChargingStations, #CityofAtlanta, #electricvehicle, #georgiapower, #HartsfieldJacksonAirport, #KaseemReed, #TimEchols | Permalink. As the leaves began to turn, three very significant events have taken place which bode well for the advancement of electric vehicles and supporting recharging infrastructure in the State of Georgia. Hartsfield-Jackson International Airport City of Atlanta Mayor Kaseem Reed has committed to the installation of 300 electric vehicle charging parking spots by the end of 2017. Sources indicate the charging infrastructure will be a mix of Level 1 charging stations, L1 plug-in outlets (owners can plug in their charging cordsets), Level 2 stations and even a few DCFC stations. Regardless, this is a HUGE step forward as the most notable gap for EV charging in metro Atlanta is the airport. The first 100 charging spots will be on-line by the end of 2016 with the remaining 200 coming on stream over the course of 2017. State of Georgia General Assembly Joint House-Senate Alternative Fuels Infrastructure Study Committee. At the end of the 2016 Legislative Session, a resolution passed forming a Joint Study Committee led by Rep. Bubber Epps and Sen. Jeff Mulls. The committee received testimony during three sessions (Macon, Ringgold, Atlanta) and concluded their public hearings on November 9th. During the last meeting at the State Capitol, electric vehicle testimony was provided by Nissan North America, the City of Atlanta (Director of Sustainability Stephanie Stuckey Benfield) and CleanCitiesGeorgia. The latter was provided by Executive Director Don Francis, whom everyone knows is the “Godfather of EV Charging” in Georgia. PHEV sales in Georgia are falling. While the State of Georgia is still #2 in the nation with 24,328 plug in electric vehicles registered (California is 10x larger at 229,723 PHEV’s according to IHS Polk data year ending August 31, 2016), Georgia PHEV sales are off over 90% and Georgia’s percent of total registrations is at only 0.4% vs. 0.8% national average. The combination of the elimination of the LEV/ZEV personal income tax credit in June 2015 coupled with the “usurious” PHEV registration fees ($204 this year) have brought the mainstream EV market to a screeching halt. At the national average of 0.8% there should be another 6,500-7,000 new PHEV’s on Georgia’s roads versus the 1,247 according to IHS Polk. Foreign Oil Dependency in Georgia is Unabated. More money is spent on petroleum in Georgia ($30 Billion) than the State Budget ($20 Billion) with the vast majority of those funds leaving the state. In contrast, electricity is generated and consumed in Georgia and those funds stay in the state. CleanCities goal nationally is to reduce and ideally eliminate the United States dependence on foreign oil. Legislators are leaving money on the table. The economic impact of EV’s in Georgia is well over $100 million per year between vehicle sales/resales, electricity consumed in Georgia and disposable income effects from lower cost electricity (yes even with gasoline at $2.50/gallon). The PHEV Registration Fee is Punitive. The $200+ PHEV registration/road use fee is twice that of the next highest states ($100 in Michigan, North Carolina and Washington State). It needs to come down. Restore a reasonable LEV/ZEV tax credit targeting 10% of the qualifying PHEV price with a cap of $3,000. Follow the Federal model of tax credit by battery size. Reduce the Alternative Fuel Vehicles registration fee to $50.00. Support EV charging station infrastructure. Address the language in the current legislation to enable the existing EV charging stations tax credit to be applied to commercial and retail properties. BOMA spokesman Mark Gallman provided similar testimony. Tim Echols created Georgia’s annual Alternative Fuel Vehicles Roadshow to showcase the capabilities of a wide variety of alternative fuels including electricified transportation. Electric Vehicles and the Southeast Grid – Newly re-elected Public Service Commissioner Tim Echols and Union of Concerned Scientists‘ Peter O’Connor convened a two-day ‘think tank’ session to discuss the current and future state of electric vehicles, and charging infrastructure, to hear case studies from regional public utilities, and take a glimpse into the future of charging infrastructure. Workplace charging was tackled by one panel and Residential charging by another. Four public utilities (Duke Energy, Georgia Power, Florida Power and Light, Jacksonville Energy Association) shared the outcomes of their initiatives to support PHEVs and recharging infrastructure. Ally Kelly from The Ray foundation shared the plans to test bed roadway embedded EV recharging on the 18 mile stretch of Interstate 85 between Georgia and the Alabama State line named in honor of the late Raymond C. Anderson, the visionary Chairman of Interface who led the carpet industry into the recycled fibers technology. Audi’s EV Architect (coolest job title at the conference) Wayne Kallen said that the first full Battery Electric Vehicle from Audi is coming in late 2018! So if one were to believe that all of the PHEV development work was taking place in California, this conference would surely have demonstrated that incredible advances are being made in the Southeast and in fact Jeff Kessler representing CARB (California Air Resources Board) said as much during his panel remarks. 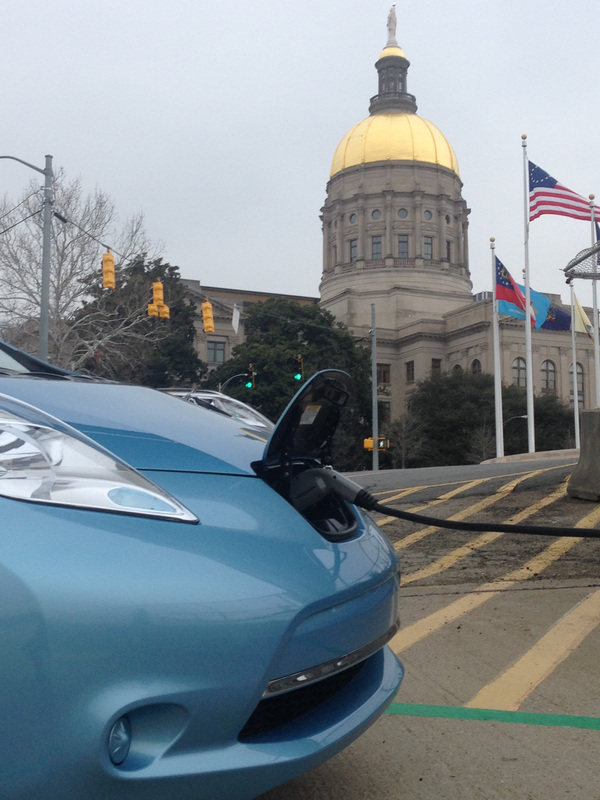 During the post 2015 Georgia General Assembly era, the electric vehicle constituents in Georgia have been very busy advancing infrastructure (4,500 Public Level 2 charging stations and 375 Fast Charge plugs), and building the case for the Legislature to restore the State to a leadership position in the advancement of Electric Vehicles in Georgia. Stay tuned as we watch how the next major development – the almost $60 million VW settlement Fund [if the State accepts it], is to be administered in Georgia. You can be sure that more charging stations (and even Superchargers) are on their way as the 2017 Chevrolet BOLT, the 2018 Tesla Model 3, all new Nissan LEAF and that all-electric Audi extend the reach the electric vehicles throughout the State of Georgia and beyond. Categories: #CityofAtlanta, #CleanCitiesGeorgia, #ElectricVehicleChargingStations, #ElectricVehicles, #EVSalesData, #GeorgiaPower, #GeorgiaStateLegislature, #Plug-In Hybrid, #TaxCredit, #Tesla, EV Charging Stations | Tags: #ChargingStations, #electricvehicle, #Innovation, #PowerGrid, #taxcredit | Permalink. Save the date! Join metro Atlanta electric vehicle owners and our event sponsors for the 6th Annual National Drive Electric Week event in metro Atlanta. This year the event will be held in Alpharetta Georgia at the incomparable Avalon community off GA 400 Exit 10 Old Milton Parkway. Check out the details at : Drive Electric Week Avalon Sept 10 2016. Please register to attend and if you are an Electric Vehicle owner, please register as a volunteer/attendee. We will have breakfast and lunch for you, a Goodie Bag and give you the opportunity tell event goers about your experience as an EV owner. I am proud to serve as this year’s City Captain along side CleanCities Georgia Executive Director Don Francis. If you would like more information about how you can get involved in the event email me at AtlantaEVDC@gmail.com or Don at don@cleancitiesgeorgia.org. Categories: #DriveElectricWeek, #ElectricVehicles, #Environment, #EVChargingStations, EV Charging Stations | Tags: #Alpharetta, #Atlanta, #DriveElectricWeek, #electricvehicle, #georgiapower, #SierraClubGA, CleanCitiesGeorgia | Permalink.